Calculated Risk: New Home Sales: Is this the bottom? 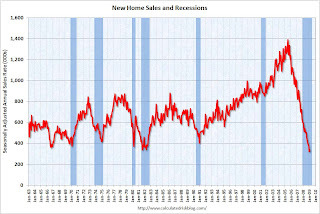 New Home Sales: Is this the bottom? Earlier today I posted some graphs of new home sales, inventory and months of supply. This is 4.7 percent (±18.3%) above the revised January rate of 322,000, but is 41.1 percent (±7.9%) below the February 2008 estimate of 572,000. The "rebound" in February was very small, and this is the worst February since the Census Bureau started tracking new home sales in 1963. This graph shows the February "rebound". You have to look closely - this is an eyesight test - and you will see the increase in sales (if you expand the graph). Not only was this the worst February in the Census Bureau records, but this was the 2nd worst month ever on a seasonally adjusted annual rate basis (only January was worse). Anecdotally, I just spoke to two SoCal builders - both told me sales had picked up in the last week or so (March). Of course sales in SoCal have been close to zero, so this is like a few rain drops to a thirsty man lost in a desert - it seems like a flood! For a healthy market, the distressing gap between new and existing home sales will probably close. This graph shows existing home sales and new home sales through February. For a number of years the ratio between new and existing home sales was pretty steady. After activity in the housing market peaked in 2005, the ratio changed. 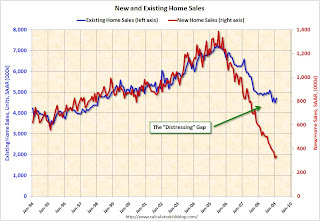 This change was caused by distressed sales - in many areas home builders cannot compete with REO sales, and this has pushed down new home sales while keeping existing home sales activity elevated. If housing bottoms (or even if the decline in residential investment just slows), this will remove a significant drag on GDP growth. This would be a positive sign for the economy. The following table, from Business Cycle: Temporal Order, shows a simplified typical temporal order for emerging from a recession. There are a number of reasons why housing and personal consumption won't rebound quickly, but they will probably bottom soon. And that means the recession is moving to the lagging areas of the economy. But we know the first signs to watch: Residential Investment (RI) and PCE. (1) In recent recessions, unemployment significantly lagged the end of the recession. That is very likely this time too. Finally, even though some signs of a bottom might emerge (housing starts, new home sales, auto sales), it is worth repeating that any recovery will probably be very sluggish. Here are a few key reasons: house prices are still too high, there is too much housing inventory (especially distressed properties), households have too much debt and need to improve their balance sheets, the recession is global, and the Obama administration has chosen a less than optimal (and very expensive) approach to fixing the financial system.